Welcome to our Ischia blog, Good Morning Ischia! Here you can see the entry for Friday 18th April 2014. Buona Pasqua e auguri a tutti! Sorry, I went all Italian on you for a moment there, just wishing you all a Happy Easter and Best Wishes for the season. Actually I'm never sure whether you're meant to say that on Good Friday or if you have to wait until Easter Sunday but nevertheless, the same sentiment holds. We've got a very pleasant afternoon here anyway with a maximum temperature of 17° Celsius (63° Fahrenheit) and yesterday's slightly chilly evening now firmly behind us. Today's photo comes from last year's "Actus Tragicus" or "Passion of Christ" which again takes place in Forio this evening. From 20:30 this evening the harbour area in Forio will be the busiest place on the island as the crowds gather to witness the annual event that takes place every Good Friday. 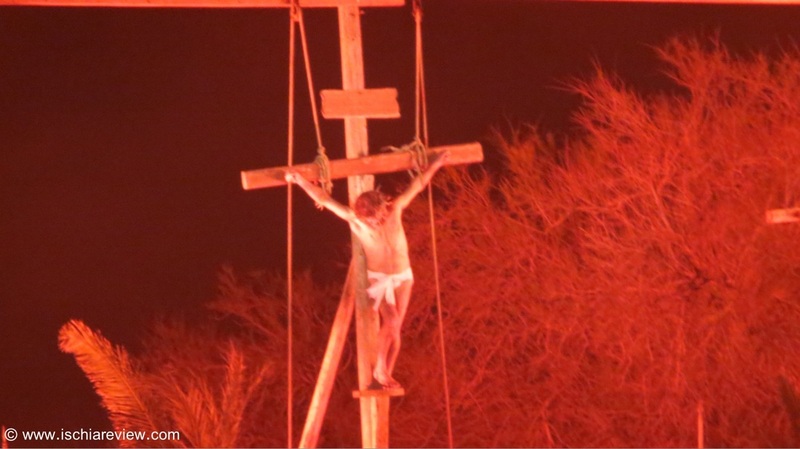 For those unaware of what the event entails, it's basically a reproduction of the events surrounding the final hours of the life of Jesus Christ, telling the story of the last supper, his betrayal by Judas Iscariot, his condemnation by Roman governor Pontius Pilate and then the subsequent crucifixion at Mount Golgotha. The whole show takes place on the streets of Forio which becomes transformed into a huge open-air theatre for the evening, complete with actors dressed as Roman Centurions and a series of sets where the different stages are acted out. There's a great PA system complete with music and commentary (in Italian) which really helps to create the atmosphere of the event as the actors perform their various roles. For anyone wishing to enjoy tonight's show, the first thing I should mention is that it's completely free as it all takes place around Forio town centre. The show starts at 830pm by the small beach near the harbour, opposite the Hotel Villa Carolina, and then continues along to the small square outside Bar La Lucciola where the first main part of the play is acted out. At the moment when the actor playing Jesus is given the cross to carry through the streets, the crowd follow along to where the climax of the event takes place outside Chiesa del Soccorso, the pretty white church that sits in an elevated position on a small promontory overlooking Forio. To make sure you get the best vantage point for the show it's best to arrive in Forio town centre as early as possible, any time up until an hour before the event as the crowds start to gather. Ok, I hope you all have a great evening at the show if you're lucky enough to be in Ischia at the moment. If any of the information above is unclear or if you need some more help and advice about where to enjoy the show please drop me a line and I'll be happy to help. Anyway, I'll be back with more later in the weekend but wherever you are in the world, have a great Easter and enjoy the festivities.